In 2015, I learned that straightforward California cuisine can still surprise and delight; that the classics are classics for good reason; and that while expensive, high-concept tacos might win my begrudging respect, the down-home taco will always have my heart. 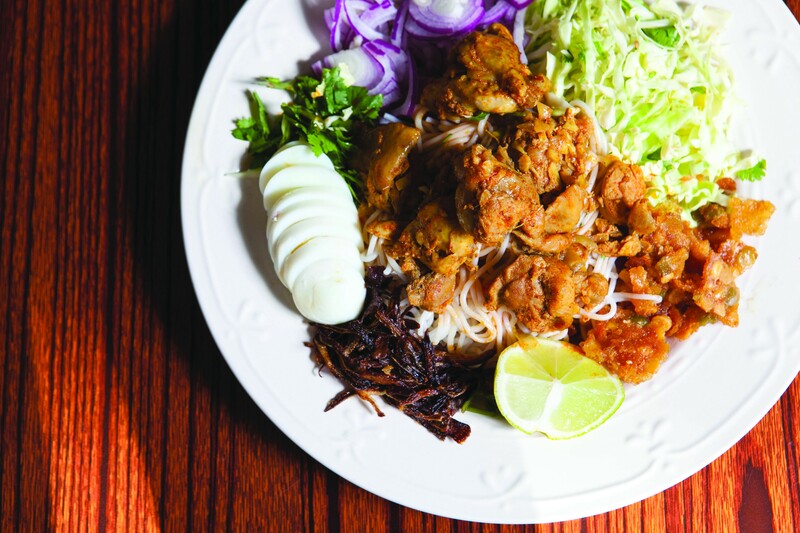 Crowd-pleasers at this tiny, homespun Burmese spot include the samusas and the tea leaf salad. But this noodle salad is the dish that most triggers the part of my palate reserved for comfort foods — the kind of thing I wolf down on days when the craving for Asian home cooking hits me like a punch in the gut. I’ve probably ordered Grocery Cafe’s nan gyi thoke three or four times at this point, and it comes out a little bit different each time — the temperature ranges from cold to slightly warm, and chunks of ham may or may not be included. What’s consistent is the dish’s singular deliciousness, which is derived from a combination of spaghetti-like rice noodles, curry-slicked chicken, crunchy bean fritters, and slices of raw onion and cabbage. The best taco at what is probably the best taqueria in Oakland features beef tripe that’s stewed slowly until it pretty much reaches the pinnacle of soft, squishy unctuousness. I’d happily eat a bowl of El Paisa’s tripa all by itself, but as with all great tacos, the true genius lies in the combination of ingredients: the griddled corn tortillas, the light scattering of cilantro and chopped onions, your choice among the taqueria’s potent red and green salsas, and, of course, a generous heap of the meat itself. 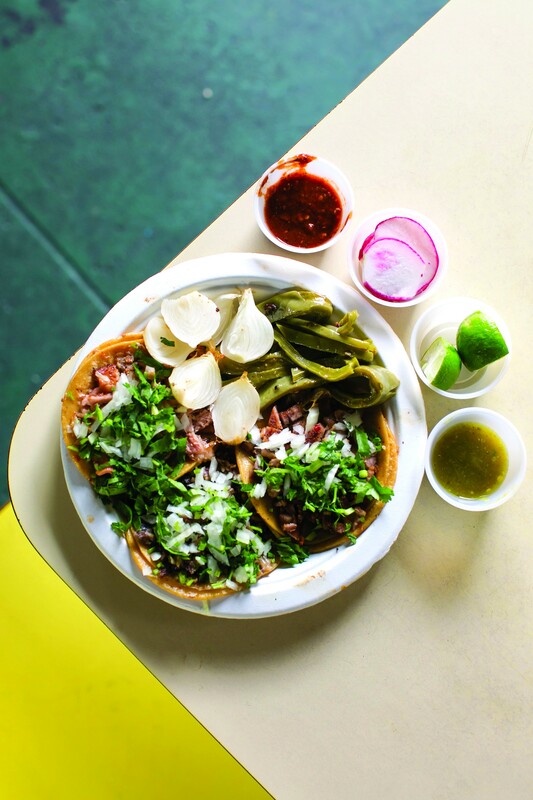 Enough words: Just go now and buy yourself a plate of tacos. The bountiful combo plates at this Cameroonian spot in Deep East Oakland have been a favorite of mine since Malong Pendar’s itinerant pop-up days, when I’d arrive at some club or dive bar to find the chef set up at a table in back, blessing lucky patrons with heaping platters of jollof rice, black-eyed peas, gingery mashed yams, the deeply savory peanut-spinach stew known as ndole, and — always, always — a scoop of his potent habanero hot sauce. Now that the restaurant has a brick-and-mortar home, the food is better than ever, as evidenced by the previously unavailable option to get your combo plate topped with shrimp. Sautéed gently to preserve their delicate quality, the shrimp are laced with just a touch of chili heat. This dish truly brings together the best of the land and sea. 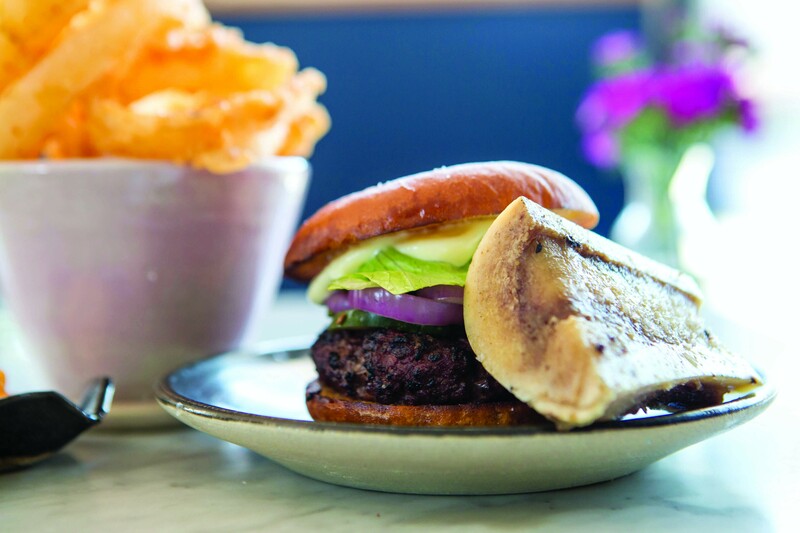 A Kronnerburger with a side of marrow. Chris Kronner talks about how his updated American diner isn’t “just some burger joint.” And it’s true: KronnerBurger also serves artful little salads, and the restaurant’s daily selection of bistro-style small plates might feature sea urchin, fermented chilies, or some obscure edible weed. And yet whenever I order something else, I always wind up feeling slightly regretful that I didn’t stick with the restaurant’s namesake dish — a burger known for its saltiness and its blood-red, inimitably beefy patty, and for the simplicity of its condiments (just iceberg lettuce, onions, pickles, and a cheddar-cheese mayonnaise). Though it might seem like overkill, don’t omit the roasted bone marrow add-on: A mere spoonful of those soft, fatty nubs helps turn an indulgent meal into an occasion unto itself. The East Bay is experiencing a golden age of hummus, with new restaurants of various Middle Eastern and North African origins springing up every few weeks, it seems, each with their own version of the world’s most popular bean dip. But the Israeli-style hummus at Ba-Bite is in its own stratosphere — smooth, ethereally light, and rich and full-flavored beyond all expectation. All you really need to turn this dip into a lavish meal is several wedges of Ba-Bite’s excellent pita, but I like to gild the lily by ordering it topped with grilled lamb. The way the swirl of meat juices mixes into the hummus — crowned, as it is, with high-quality olive oil — is impossible to resist. Even a mediocre breakfast sandwich has its charms — eggs, breakfast meats, and toasted bread products being foods difficult to butcher completely. And when each component is done just right, you wind up with something that’s damn near magical. The virtues of Sequoia Diner’s breakfast sandwich include its fluffy, folded-up egg omelet and your choice of sausage or bacon, both of which are house-made and of superior quality. The best parts, however, are the slather of garlicky aioli and, if you choose to sub it in for the also-excellent English muffin, the intensely buttery biscuit — a peerless vehicle for a breakfast sandwich. Of all the restaurants I wrote about this year, King Tsin is probably the one I’ve returned to the most frequently, and with the greatest eagerness. Any number of dishes at this Sichuan restaurant could have made the list: the decadently fatty five-spice braised pork shoulder that was tender enough to cut with a spoon, or perhaps the surprisingly enjoyable “squirrel fish” — wherein the fish’s flesh is scored in such a way that it puffs out like a squirrel’s tail when fried. But the Sichuan classic I kept going back to was this: tender slices of fish cooked gently in a pool of Sichuan peppercorn-infused red sauce that numbs your mouth while simultaneously setting it aflame. An order of King Tsin’s version, along with a big bowl of rice and an order of the restaurant’s puffy sesame flatbread to help soak up all that sauce, is pretty much my ideal dinner. The pescado a lo macho rewards the patient diner. Staying with the seafood theme, I can’t recall another year when so many East Bay restaurants put whole fish preparations on their menu. It’s a trend I heartily endorse. The best of the bunch was the pescado a lo macho at El Mono, a scrappily ambitious Peruvian spot in El Cerrito. 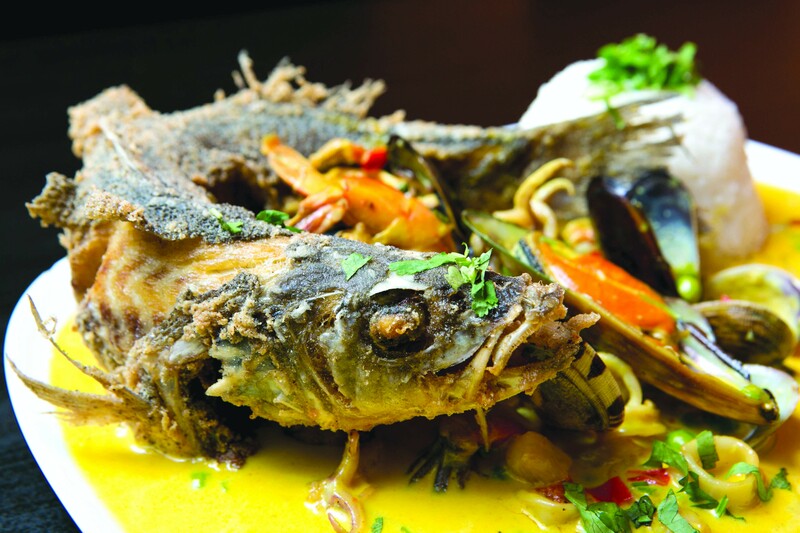 This is a dish for serious whole-fish eaters: a fried sea bass that’s positively sea serpent-like in its appearance, curled, as it is, around a rich, bright-yellow stew of clams, mussels, shrimp, calamari, and scallops. This is a dish that rewards the patient diner — the one who dispenses with cutlery to pick every last morsel of flesh off the bone, and who asks for extra rice to soak up every drop of the aji amarillo-infused sauce. I wouldn’t have guessed that something as seemingly mundane as chicken liver toast would be one of the most delicious things I’d eat this year, but, then again, The Advocate’s take on the classic is hardly your run-of-the-mill cocktail-party crostini. Every component of the dish is exceptional. The wood-grilled bread is thick-sliced and luxurious, and the generous smear of whipped chicken-liver terrine is as decadent as it is remarkably moist and light (especially if you’re expecting Grandma’s chopped liver). The coup de grace, at least in the early-autumn permutation of the dish that I sampled: a mixture of almonds and tiny, exquisitely sweet grapes that provided just the right counterbalance to all that liver-y richness. I like a sandwich that’s stolidly portable and sog-proof — with anything saucy or liable to squirt its juices safely contained within the bun. But let us also praise the sandwich that embraces its sogginess — the Chicago-style Italian beef, the Turkish islak burger, and this Oakland original: the “drowned” fried chicken sandwich at Salsipuedes. I love everything about this inspired piece of New Baja fusion cooking: the impeccable juiciness of the katsu-style chicken, the funk and tang of the kimchi, and, best of all, the torpedo-shaped bolillo roll that’s soaked through — in the style of a Mexican torta ahogada — with an umami-spiked house-made katsu sauce. The sandwich comes cut into three sections for ease of sharing, but believe me: You’ll want to eat the whole thing yourself.